Here are three situations involving changes in temperature. Represent each change on the applet, and draw it on a number line. Then, answer the questions. At noon, the temperature was 5 degrees Celsius. By late afternoon, it has risen 6 degrees Celsius. What was the temperature late in the afternoon? The temperature was 8 degrees Celsius at midnight. By dawn, it has dropped 12 degrees Celsius. What was the temperature at dawn? How did you name the resulting temperature in each situation? Did both of you refer to each resulting temperature by the same name or different names? 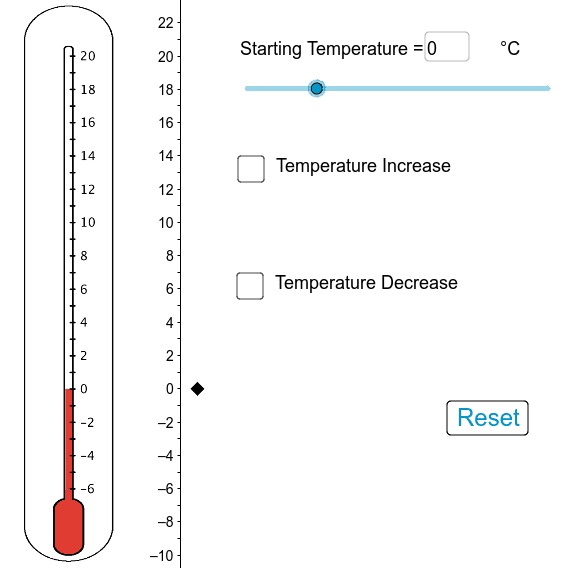 What does it mean when the resulting temperature is above 0 on the number line? What does it mean when a temperature is below 0? Do numbers below 0 make sense outside of the context of temperature? If you think so, give some examples to show how they make sense. If you don’t think so, give some examples to show otherwise.